I'm not sure what game this is. It is that time in Arizona! That time of year when I love being outside, when yard work feels more like a treat than a chore, and when I feel like a kid who needs to be told to come inside. I love Arizona in the wintertime. This past weekend I decided to do some major bush trimming. I have a hedge of oleanders that was getting out of control and it was time to show it who is in charge. So I began hacking away and almost instantly all three kids wanted to be outside. My initial thought was to tell them to stay inside, to keep out of the way, to avoid the dangers of a falling branch or a splinter. And then I realized that I had absolutely no basis for them not to be outside. No, the magical part was the playing, the laughter, and the imagination. Listening to the giggles as the kids hid behind branches, or pretended that one was royalty and the other two would fan with branches, or building a mountain of branches to see who could climb up the highest. Listening to these giggles and this excitement and this joy made my chore that much more bearable. At one point my six-year-old asked me if they could go watch t.v.. I told her that I was enjoying listening to them play and I wanted the company, and they stayed out with me for another hour. What a joy it was to have the kids imagining and playing and interacting. Yes, there were branches everywhere that I had to help them pick up. Yes, there were some owies from branches being swung around or stepped on. But the kids were having a great time, and I am so thankful that I got to be part of it. This made me think about what would have happened if I let them go watch t.v. instead of play outside. I would have missed out on the teaching moments ("Daddy, what's the difference between that trimmer and a chain saw?"). They would have missed out on the fresh air and the sunshine. We all would have missed out on the time together. Day 2-3 involved chipping up all of the branches using my Patriot Electric Chipper. I started by sharpening the blade, and man did that make a difference. I chipped for three hours on day 2 and two hours on day 3, creating enough chippings for the next year of compost. The great part of this was that the kids again wanted to be outside with me and wanted to be part of what I was doing because the stage was set from the day before. We talked about compost, princesses, garbage trucks, and power tools. It doesn't get better than that. My six-year-old was again heavily involved, bringing me branches to chip up. She even got to run a couple of branches through the chipper (with daddy's very close supervision), and the smile on her face was priceless. This whole project made me wonder how many times my immediate response to my kids is to avoid the work area. There are times when I want them to help me with a project, but other times when it feels like a hassle to have them around. It would have been so much easier if I had cut the oleanders and left everything in a nice neat pile, rather than having the branches and debris spread all around the yard. I may have even saved a day of chipping if I could have moved at my own pace. But I would have missed out on time spent with the kids. Sure it is more work, and yes there were plenty of fights that I had to mediate (please do not assume that my kids are all smiles when they're playing), but the time spent with the kids, the lessons that they are learning, and the love of doing things as a family make that extra work worth it. Have a wonderful Christmas, Renaissance Dads and Moms. Original light fixture. Pathetic, am I right? enjoyed the years of updating, remodeling, changing, and improving that house. Of course that was before kids, which puts a strain on both time and money. Fast forward to 2014, and with three kids ages six, four, and two, I have not been as able to remodel our house. But I found a way to alleviate the money constraints that come with remodeling. In the past, I would get a project in mind and I would go out looking for the materials. Of course I would shop around and look for the best deal, but I always had that certain project in mind. I realized that with a tighter budget (I had no idea what an impact kids would have on a grocery budget. My four-year-old apparently is on the Michael Phelps diet), I needed a different approach to home remodeling. My wife and I sat down and looked at the projects that we wanted to complete, and then I kept my eyes opened for great deals. The benefit of remodeling this way is that I am able to catch great deals when they happen. The disadvantage is that I do not get to necessarily choose the order in which I complete home projects. But, since I love working on our house, this is not that big of a problem for me. Our shower/toilet room only had a single light fixture that poorly illuminated the room, and there was no exhaust fan to eliminate the moisture from the shower. So throughout several trips to my local Lowe's, I found some bathroom light fixtures on clearance. I didn't have a rigid vision for what I wanted to do with the lighting, so these fixtures fit within the parameters. I purchased two recessed lighting fixtures (for use in wet locations), one bathroom exhaust fan (extra quiet), and an exhaust vent for my roof. I had electrical wire and switches on hand, so in total I spent $115, with the regular price of the light fixtures being $195. I initially planned on doing this project from the attic. If you have never worked in an attic before, let me bust a myth. In advertisements for insulation installation, there is always a tall guy standing upright in clean air and bright light, with a smile on his face. This is not my experience. Attics are dark, hot, dusty, cramped, and you are required to crawl on your belly through a maze of wires, ducts, insulation, and roof nails. In short, I hate working in the attic. After realizing that I didn't want to spend the morning in the attic, I decided that all of the work could be completed from the bathroom. One additional benefit of working from the bathroom was that I could have my helper available. He did a great job of tightening the ladder, measuring the piles of debris, and telling me when I dropped a tool on the floor. Before beginning, I turned off the electrical. This is very important when working on electrical, especially in the bathroom. I removed the old fixture and cut the appropriate sized holes for each of the new fixtures. Cutting into ceiling drywall is fantastic because it allows you to experience snowing insulation. Please make sure that little helpers are not in the area during this time. years ago somebody told me that I could dissipate the humidity into the attic. This is a terrible idea and will result in mold and possibly some furry critters enjoying the sauna-like environment of your attic. With the exhaust fan and lights in place, I turned on the power to ensure that everything was working properly. I then moved to the roof for the vent installation. With the hole as my marker, I cut a hole through the shingles and plywood for the exhaust vent. I reached down and pulled up the duct and connected it to the vent. After securing the vent to the roof, I liberally applied roof caulk to seal up any holes or seams around the vent. If you decide to take on a project like this, my biggest piece of advice would be to be very careful with your drywall cuts. Making careful cuts with this project meant that I had no drywall repair (I think this may be the first project that I have ever done that did not need drywall repair). The adage is measure twice and cut once, but I end up measuring twice, cutting once, and then shave, shave, shave until I have it perfect. And speaking of shaving, with these new lights, I'll finally be able see what I'm doing well enough to get a good shave! ice, warm weather, and insanely hot why-did-I-choose-to-live-on-the-sun weather. With our two seasons come two types of grass that will grow. The nice warm winter season utilizes rye grass, while the please-let-me-die summer is surrounded with nuclear bomb-proof Bermuda grass. If it is not clear by these descriptions which grass is nicer, then I have failed in my use of creative adjectives. So the advantages of over seeding with rye grass in the winter are that it keeps the lawn a nice dark green, I get to continue to mow throughout the pleasant weather (yes, for me that is an advantage), and my kids have a soft outdoor carpet of grass to play on at the time when it is actually possible for them to play outside. Based on these advantages, I seldom think of the disadvantages, so here is how to over seed a winter lawn in Arizona. 1). Choose the time of planting. Rye should generally be planted when nighttime temperatures are in the 60s. About a week or so before the big day, start to cut the water back on the Bermuda lawn, helping the Bermuda grass to go dormant. 2). Mow it. Cut the grass as low to the ground as you can, bagging the clippings. Depending on the thickness of the lawn, you may need to make multiple passes. This year, I had to mow my lawn three times, decreasing the height slightly each time. 3). Break up the thatch. The thatch is the layer on top of the soil made up of organic material, roots, dead grass, etc. There are blades that you can put on your lawn mower that will help break this up, or you can go at it with a hard rake. After breaking up the thatch, make one more pass with the lawn mower, bagging the clippings. Never turn your back on the poop. 4). This is where it gets fun. Spread the seed on the lawn, using either a broadcast spreader, a drop spreader, or your hands. This is when my kids begin to have fun and work on the lawn with me, but it gets even better. 5). After the seed is spread on the lawn, bring on the manure! 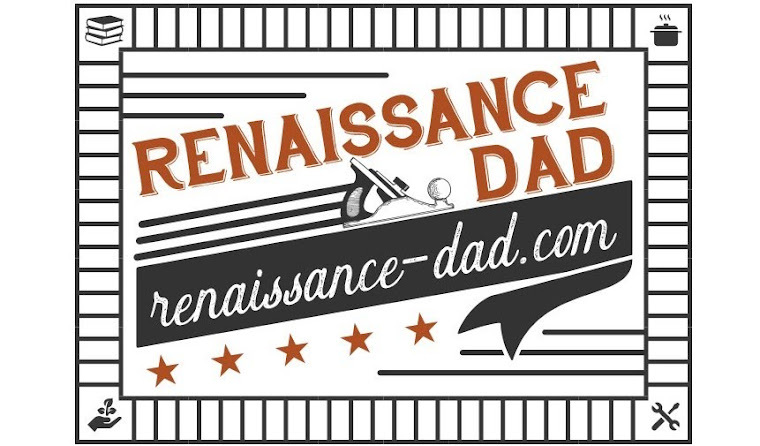 Yes, most Renaissance Dad readers know how much I love manure. This is yet another opportunity to share the smell of cow manure with your neighbors. This is a time when the kids not only get to say "poop" as much as they want to, they actually get to throw poop. The lawn only needs a thin layer, but it helps to get the seeds going. Actually, let's back up. Before you start with the manure, make sure your kids are not wearing their best shoes. Yes, I am speaking from experience. 6). Until the grass starts growing, you'll need to water two or three times per day for about five minutes per watering. After the grass starts growing, cut back to every three or four days until the weather cools off, then cut back to once per week or so. 7). Apologize to your spouse for the way you and the kids smell. Take a very, very long shower with lots of soap. Make sure you clean out your nostrils, or everything will still smell like manure. So why write this post? Am I bragging about my lawn? Not really. Am I rubbing it in most of the world's face that we have beautiful weather for the next six months while most of you don't? Maybe a little. Actually, I had so much fun with my kids throwing poop around the yard, that I just wanted to write about that. But I can't very well write about how my kids and I throw poop around every October without you all thinking that I'm nuts...unless I throw in some grass seed, and then it's totally normal. 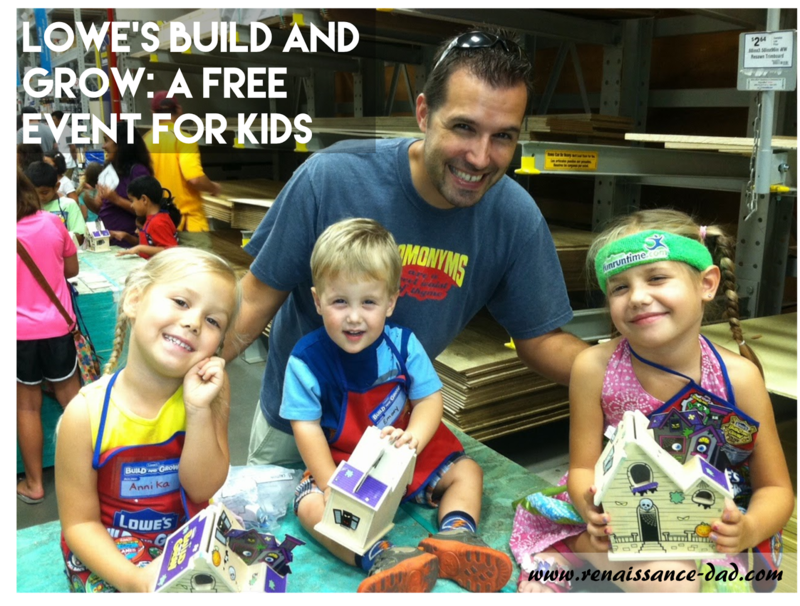 When Big E, my oldest daughter, was 2, I discovered a magical event at our local Lowe's Home Improvement store - Build and Grow clinics. These Build and Grow clinics occur about every two weeks or so and give kids the opportunities to build a wide variety of wood projects. The pieces are pre-cut and pre-drilled for nails, the picture instructions are easy for older kids to follow, and the wide variety of projects help keep the kids' interest. And did I mention that these clinics are FREE?!? That's right, the Lowe's clinics are FREE. Each child gets a free apron, free safety goggles, the project, and an iron-on patch for their apron (I have used a variety of methods to attach the patches to the apron over the years, and I still find that, while the iron-on patches are great, nothing beats the speed of a hot glue gun). For each additional week, kids get the project and the patch. 45 projects together. We regularly look at the apron and remember projects that she made as gifts: the pet leash holder for great-grandma, the planter trellis for mom for Mother's Day, the race for her little brother. And then as the number of kids have increased, we have added to the fun by taking brother and sister to the clinics. product, but in my kids finding satisfaction in completing a project. Be a help, but let your kids do the work. 3). The projects make great gifts for parents and grandparents. Usually, around Mother's Day and Father's Day, Lowe's offers projects that would be appropriate gifts - picture frames, planters, keep sake boxes, etc. My kids have loved giving some of their projects to loved ones, and they can proudly tell them that they made it. If you haven't visited a Lowe's Build and Grow clinic with your kids, I highly recommend it. This is age appropriate for kids from 2 to 12 or so (I've seen parents with infants at these clinics, and that might be a bit young to learn to swing a hammer). If you don't have a Lowe's in your area, check with your local home improvement store and see if they have a similar program. I know that Lowe's also offers the kits to purchase through their website, so ordering some online is an additional possibility. I can't tell you the number of times my hands have been hit with tiny hammers as I held pieces together for my kids to nail. Nor can I tell you the number of burns I have sustained hot gluing patches onto their aprons. And then there are the countless times I have tripped over small wooden toys laying around the house. And yet I smile as I'm writing this because I have even sweeter memories of time spent with my kids. The joy of my 2-year-old asking me, "Daddy, wanna go to Lowe's with ME?" The giggles as they hammer and put stickers on their projects. The smile on my wife's face when she receives the gift of two hours of solitude. These are the building blocks, figurative and literal, of what I love about Lowe's Build and Grow. This is why Lowe's is the place for a Renaissance Dad (Lowe's, if you're reading this and want to sponsor my blog, please let me know). Okay, I know that in my last post I promised a two part post about new tools, but this one is too good to pass up. I also know that a lot of my posts make "life changing" claims, from Limoncello to fall beverages, from Italian Feast to Lemon Pound Cake. But this, my friends, just may top them all. It is simple, takes merely four ingredients and a few minutes to make, and will cause your wife to want to get lovey-dovey no matter what kind of day she's had. Here is one of the simplest, most amazing desserts you will ever, and I mean EVER, make. 1). Lay the tortilla out and place some chocolate chips and raspberries inside. When I first made these, I had a tendency to overload the burritos, causing them to spill out. You want a good number of berries and chocolate chips, but not too many. 2). Roll the tortilla into a burrito shape. If you don't know how to do this, start by folding opposite edges slightly in. These will be the top and bottom of the burrito. Next, roll one remaining side on top of your ingredients. Finally, fold the last remaining side on top of this last side, closing the burrito. If you still don't know how to fold a burrito, take a trip to Chipotle, order a burrito, and watch them roll it up. 3). Spread softened butter on the outside of the burrito. Be sure to spread butter under the last flap, sealing the burrito. 4). Place the buttered burrito, flap side down, on a skillet or grill preheated to medium. Yeah, I said grill. These are amazing grilled, but are also--well, amazing--in a skillet. 5). Now comes the difficult part of balancing patience with vigilance. If you wait too long to flip the burrito, you may burn it. If you flip it too early, you may end up spilling out the berries and chocolate chips. Depending on the temperature, two to three minutes per side tends to be just right. Flip the burrito and brown the other side. 6). Serve with whipped cream, ice cream, or both! These can be made ahead of time and refrigerated. I have found that refrigerating them helps harden the butter, which keeps the burrito from opening up when being placed on the grill or skillet. However, if you use frozen berries, they may juice up and soften the tortilla. And speaking of softening the tortilla, warming up the tortilla briefly before filling it will aid in the rolling of the tortilla and help prevent tears. While I have never actually made them this way, someday I would like to use a burrito size tortilla for a jumbo dessert! I'm pretty sure that would be life changing. I love fall. I love fall because Arizona is so hot during the summer, and fall is the sign of many months of wonderful weather. During the summer in Arizona, I can walk out of the house at five in the morning and the temperature is already 90 degrees. Hope comes on that first day of fall when I walk out of the house and am hit with air that is cooler than the air in our house. That is always my favorite day of the season. And now I have a new fall experience that I would like to share with the world. The other night my wife and I were sitting on the couch after we got the kids down. We each had an adult beverage - she had a hard cider, and I had a delicious pumpkin beer. We each took a couple of sips, and then we had the epiphany. And by "we" I mean my wife. We looked at each other, looked at the beverages, and my wife said what we were both thinking, "What if we mixed these?" GENIUS! I am married to a genius! So here is the Renaissance Dad's Fall beverage - equal parts pumpkin beer and hard cider. This is such an amazing beverage, and I am here and now claiming naming rights to this deliciousness. However, I now need help from my readers. What should this beverage be called? Apple Jacks? Apple Spice? Pumpkin Pie? Apple and Tan? Let the naming suggestions begin. Here's to the hope of fall weather, and the beverages that help us along!